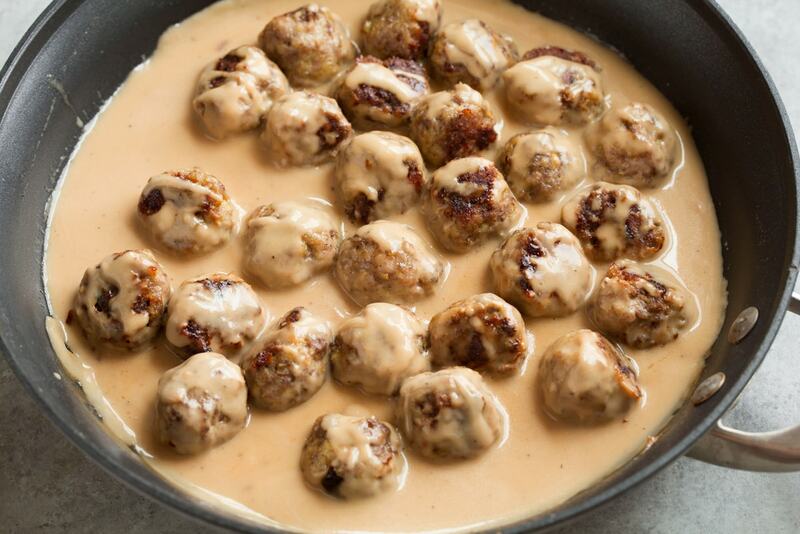 Easy Swedish Meatballs made with a blend of flavorfully seasoned beef and pork and tossed with a blanket of rich homemade gravy. 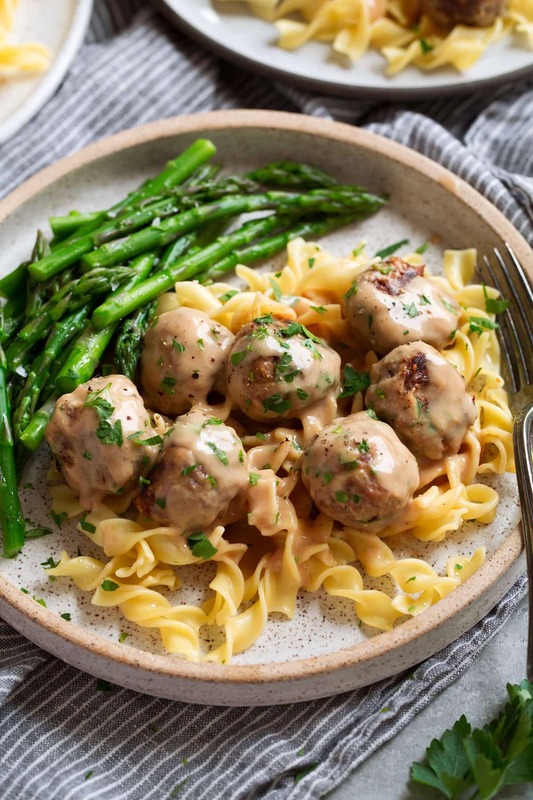 These are perfectly hearty and tender and you’ll love that this version is oven baked so there’s no tending to each meatball individually and cooking in two batches to fit in a skillet. 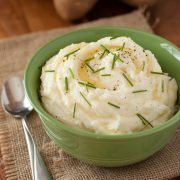 It’s a comforting homestyle dinner that’s sure to satisfy! And did I mention these are way better than Ikea’s? 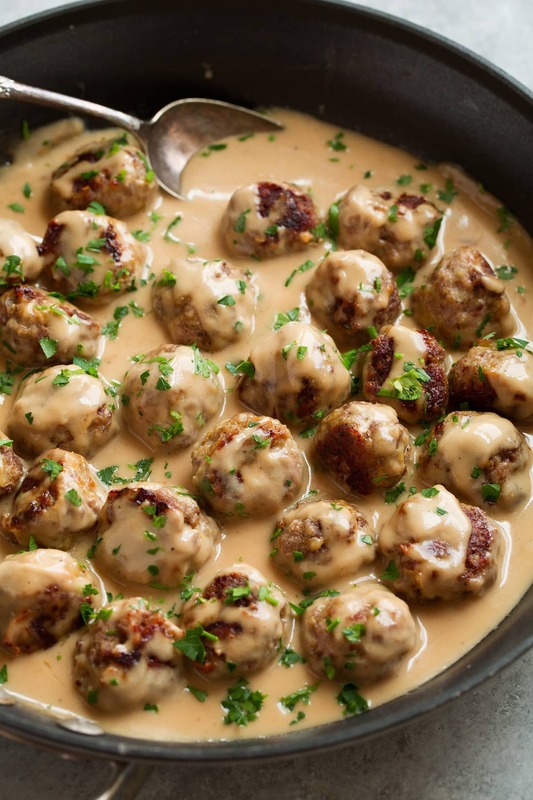 Swedish Meatballs are a classic Swedish dish typically made up of a blend of ground meats, vibrant spices, and they’re paired with a rich and creamy beefy gravy. Traditionally you’ll find them served up with mashed potatoes and paired with a side of bright, sweet lingonberry jam (which tastes a lot like cranberry sauce). 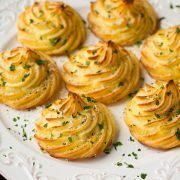 I love them paired with both when I’ve got time to make mashed potatoes but for an easier weeknight dinner they’re also delicious served over a bed of egg noodles, the prep is so much easier! What Ingredients go into Swedish Meatballs? 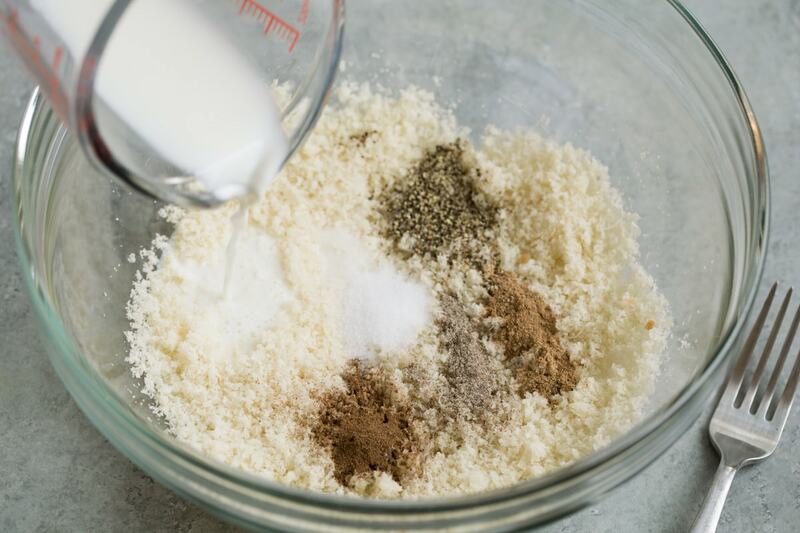 Fresh breadcrumbs: fresh breadcrumbs will give better flavor and texture rather than using dried. Spices – nutmeg, allspice, cardamom, salt and pepper: these spices give the meatballs their unique flavor. If you don’t have cardamom you can omit it because it is a bit pricey. 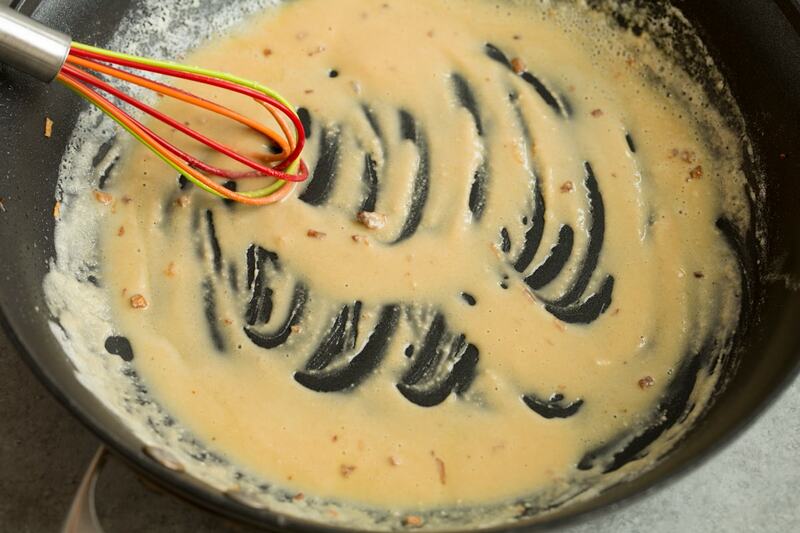 Butter and flour: needed for the base of the roux for a buttery, nicely thickened gravy. Yellow onion and garlic: these add lots of flavor, garlic isn’t so traditional but I say a little never hurt. Milk: this adds moisture to the meatballs. Preferably use whole or 2%. Egg yolks: I like to use just yolks so egg whites don’t make the meatballs rubbery or dry. 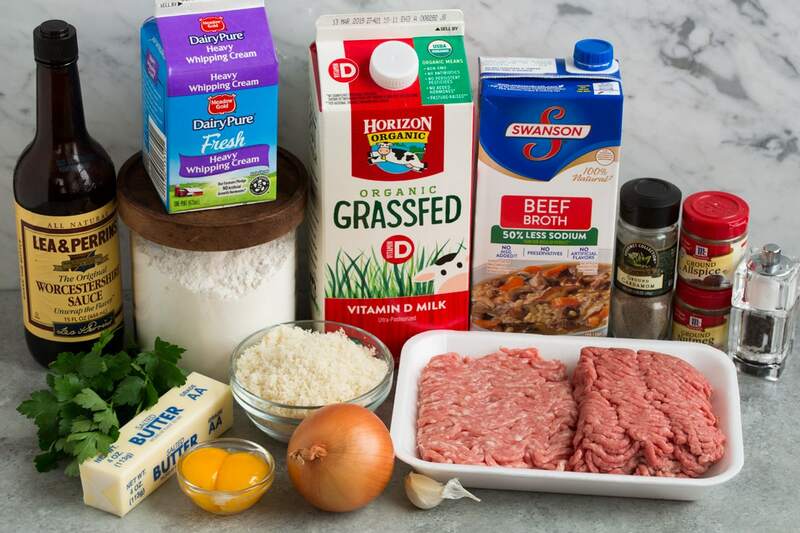 Ground beef and ground pork: the blend of the two adds the perfect flavor. I use 85% lean beef. The fats keep the meatballs juicy and tender, plus they’ll brown better. Beef broth: I prefer to use low-sodium broth but regular will work fine too. Heavy cream: feel free to use less broth and more cream for an even richer gravy. Worcestershire sauce: this adds a great depth of flavor to the gravy and really enhances beef flavors. Fresh parsley: this just adds some nice vibrant color to pair with an otherwise neutrally toned dish. Preheat oven, prepare baking sheet: preheat oven to 400 degrees. Line a rimmed 18 by 13-inch baking sheet with aluminum foil, spray with non-stick cooking spray. Soak breadcrumbs and seasoning: add bread crumbs, nutmeg, allspice, cardamom, 1 tsp salt (or to taste), 1/2 tsp pepper to a large mixing bowl. Pour in milk and toss with a fork, let rest while sautéing onions. 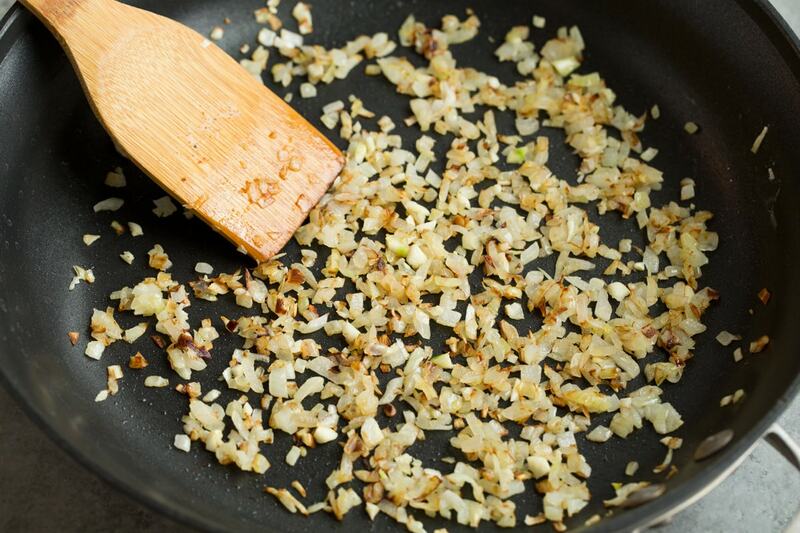 Saute onions and garlic: melt 1 Tbsp butter in a 12-inch skillet over medium heat. Add onions and saute until softened and slightly golden brown, about 6 minutes, while adding garlic during the last 30 seconds. 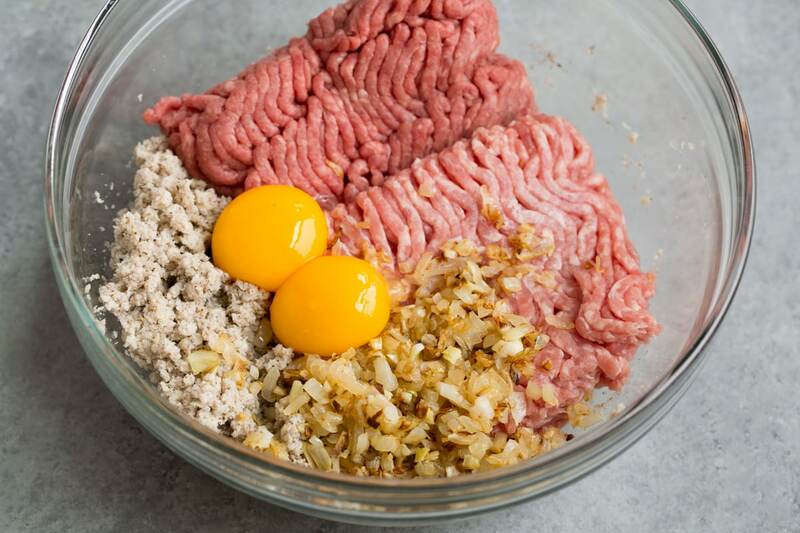 Make meatball mixture: add beef and pork to bread crumb mixture along with egg yolks and onion mixture. Gently toss mixture to evenly distribute ingredients. Shape into individual meatballs: scoop dough out 1 oz at a time (using either a medium cookie scoop or nearly 2 tbsp each) and shape into balls. Tip: if mixture is sticky to work with try chilling 30 minutes and using slightly wet hands to roll. 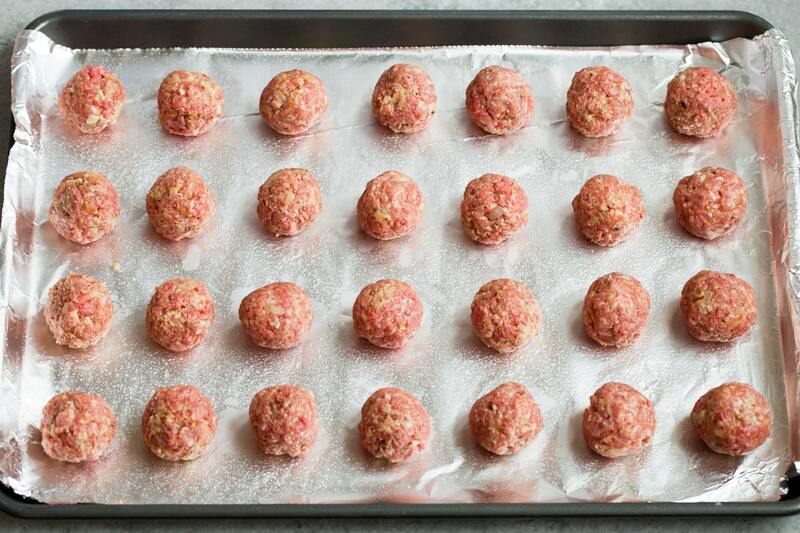 Align on baking sheet: transfer formed meatballs to lined baking sheet placing in rows, spacing them evenly apart. 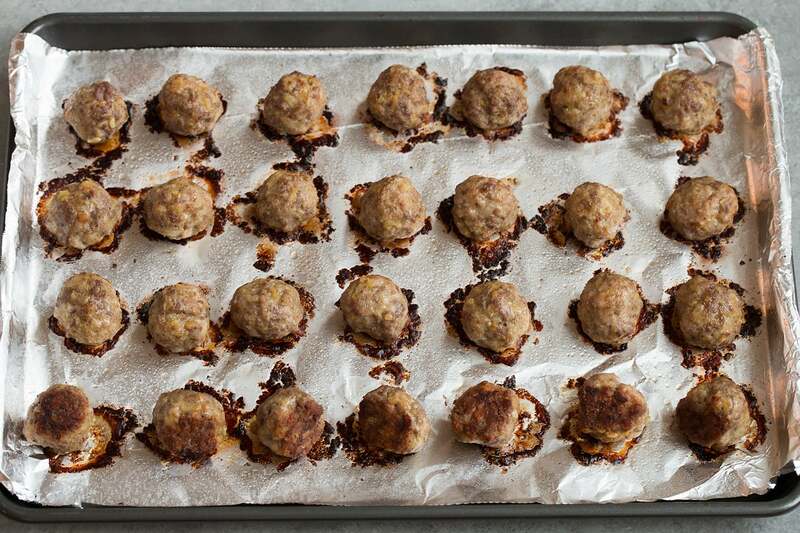 Bake meatballs: bake in preheated oven until cooked through (center should register 160 degrees on an instant read thermometer), about 18 – 22 minutes. See how the front row is nicely browned on bottom? Make roux: in same skillet used to saute onions melt remaining 3 1/2 Tbsp butter over medium-heat. Add flour and cook and whisk until golden brown, about 3 minutes. 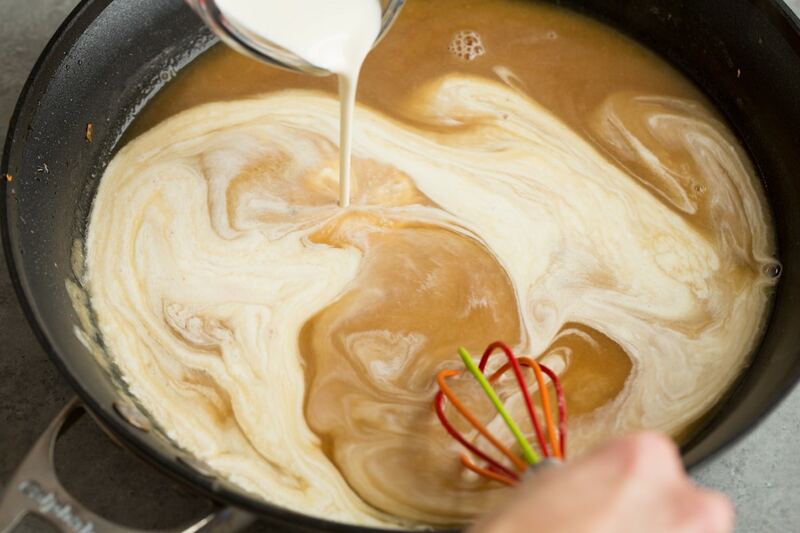 Add liquids: while whisking, slowly pour in broth and cream. Add in Worcestershire sauce, season with salt and pepper to taste. Let simmer and thicken: bring to a simmer over medium-high heat whisking constantly. For a thicker consistency simmer over low heat for a few minutes. Toss gravy with meatballs: add meatballs to warm sauce and toss, sprinkle with parsley. Serve warm with egg noodles or mashed potatoes and lingonberry sauce if desired. 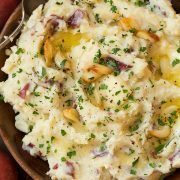 Can I Use Sour Cream in place of Heavy Cream? If preferred you can also use sour cream here in place of heavy cream, and you can add a little extra if desired. I just personally prefer the flavor of cream here. Can I Use All Ground Beef? If you’d prefer not to purchase both types of meat you’ll be fine to use just ground beef in this recipe. Can I Cook the Meatballs on the Stovetop Instead of the Oven? I’ve also tested cooking these meatballs in a skillet on the stove, it works but it takes more effort and it’s harder to get them all evenly cooked in the center. If you’d like to try it, cook half of the meatballs at a time in a large non-stick skillet in a few tablespoons of olive oil, cooking on all sides until 160 in center (it will take about 8 – 10 minutes). 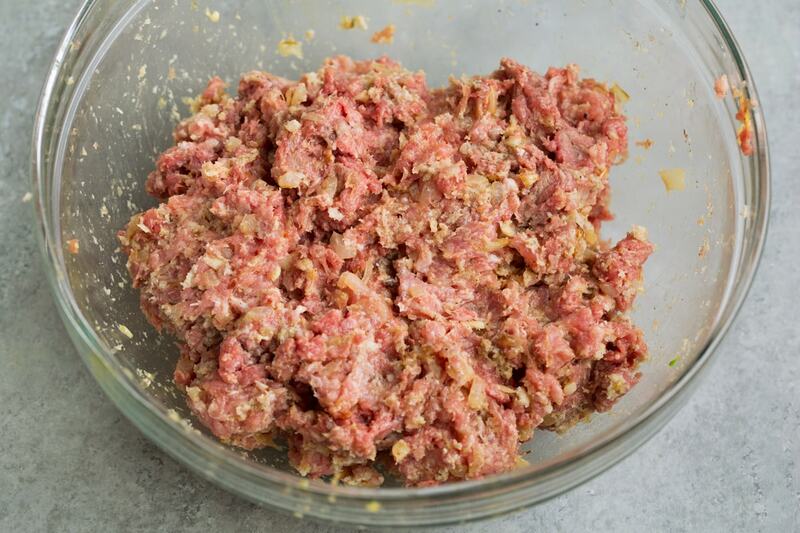 If you are looking to cut out a step from the recipe I’d suggest trying the meatballs with onion powder and garlic powder (3/4 tsp and 1/4 tsp) in place of fresh onions and garlic, it won’t be quite as good as fresh but it will save prep and cook time. Then as far as fresh breadcrumbs go, whenever you’ve got leftover fresh bread blitz it up in the food processor to crumbs then save it in the freezer for recipes like this one. Save time by using a cookie scoop to measure out meatball portions. This will also help them cook more evenly if they’re the same size. 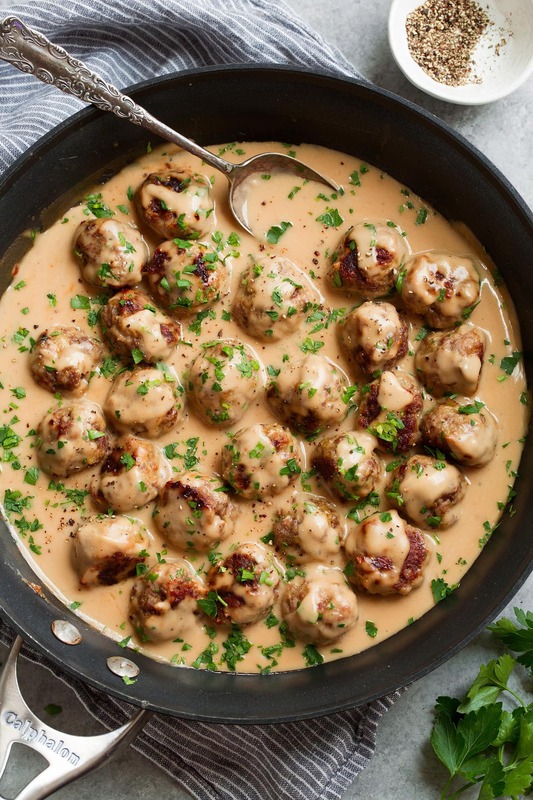 Easy Swedish Meatballs made with a blend of flavorfully seasoned beef and pork and tossed with a blanket of rich homemade gravy. 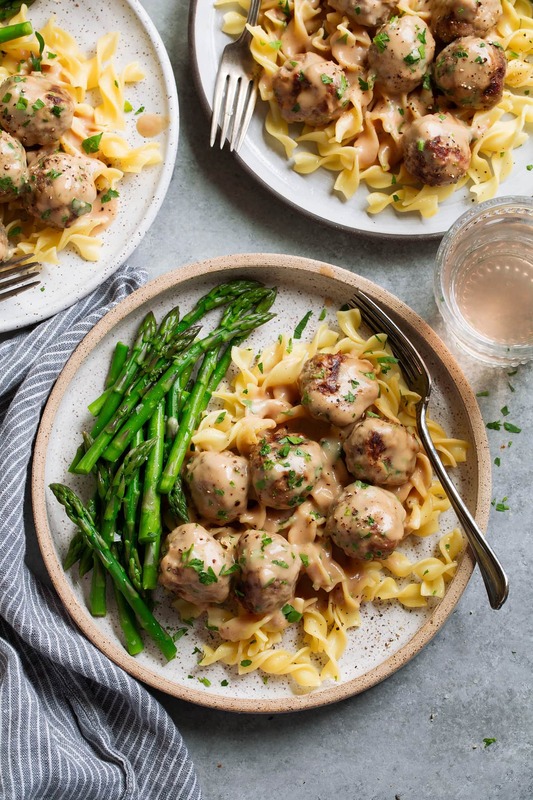 These are perfectly hearty and tender and you'll love that this version is oven baked so there's no tending to each meatball individually and cooking in two batches to fit in a skillet. Preheat oven to 400 degrees. Line a rimmed 18 by 13-inch baking sheet with aluminum foil, spray with non-stick cooking spray. Add bread crumbs, nutmeg, allspice, cardamom, 1 tsp salt (or to taste), 1/2 tsp pepper to a large mixing bowl. Pour in milk and toss with a fork, let rest while sautéing onions. Melt 1 Tbsp butter in a 12-inch skillet over medium heat. Add onions and saute until softened and slightly golden brown, about 6 minutes, while adding garlic during the last 30 seconds. Add beef and pork to bread crumb mixture along with egg yolks and onion mixture. Gently toss mixture to evenly distribute ingredients. Scoop dough out 1 oz at a time (using either a medium cookie scoop or nearly 2 tbsp each) and shape into balls. Transfer to prepared baking sheet spacing evenly apart. Bake in preheated oven until cooked through (center should register 160 degrees on an instant read thermometer), about 18 - 22 minutes. Meanwhile in same skillet used to saute onions melt remaining 3 1/2 Tbsp butter over medium-heat. Add flour and cook and whisk until golden brown, about 2 - 3 minutes. While whisking, slowly pour in broth and cream. Add in Worcestershire sauce, season with salt and pepper to taste. Bring to a simmer over medium-high heat whisking constantly. For a thicker consistency simmer over low heat for a few minutes. Add meatballs to warm sauce and toss, sprinkle with parsley. Serve warm with egg noodles or mashed potatoes and lingonberry jam if desired. *To make fresh bread crumbs I use day or two old fluffy French bread. Remove crusts, tear bread into pieces then blitz in a food processor until they're fine crumbs.